Is Ramadan All Fun & Games? Holy month of Ramadan; we all are well aware of what it means to us all as it is a soul-cleansing month & a month that comes with a purpose, a purpose so pure which each one of us tries hard to benefit the most from. If I take a look back, just a few years ago our TV Channels used to make some changes in their transmissions where they arranged shows which actually had a motive & served a purpose of educating people about Islam, bringing them closer to their religion & connecting them to it but sadly, that’s a history now & in the recent years the content that our TV Channels are churning out in the name of Ramadan lacks meaning & purpose. It is actually quite a sad state of affairs that our TV Channels have commercialized Ramadan to an extent where along with themselves, they make sure that people indulge in the meaningless activities & deviate away from the the essence of this month, which is only about earning blessings. When Ramadan began, quite a lot of memes & video clips started circulating on social media with the questionable things that were being shown during the night transmissions on a lot of channels in the name of Game Shows. As much as I stay away from these shows, those updates made me curious to find out what was actually happening that people were so bothered about & I actually wanted to see what purpose were these shows serving. The man in question was none other than Amir Liaqat & going by his colorful history, I knew anything could be expected of him. I gave a quick go to the couple of episodes of his show to actually see what he was selling this year around in the name of Ramadan & I must say more than him, I was shocked a great deal at his audience because sadly, the hunger for free giveaways has made people turn into his minions who would dance to his tunes in a hope that by the end of the show, they will walk away with some gift hampers, despite knowing that they were leading a fine & healthy life without those freebies. His live shows went on-air right after Iftaar & I was always amazed at the audience that showed up wondering why would they miss an opportunity of breaking their fast at their homes in peace but as I began watching these episodes, I understood that a mobile & bike meant something special to them. I was shocked to see that couples belonging to decent backgrounds were also a part of the audience who felt no shame in asking (read begging) for bikes, laptops, mobiles, cars & even diamond rings for their ammans or begums. A lot of youngsters were also a part of his audience who only showed up with a hope that may be they will attract Amir Bhai’s nigah-e-karam & that will win them something that they will shamelessly demand or beg for. I am not sure what has gone into people especially youngsters & gentlemen, what makes them so helpless that they find no shame in begging someone for basic things on live TV? Where has the sense of pride & dignity gone in our people that they don’t even think for a second before turning into personal puppets of Amir Liaqat thinking that we’ll get what we want if we’ll follow his commands? Why do men (who make the most of his audience) have no confidence in themselves that they can work hard & earn these things themselves? What makes them so desperate that they don’t mind barking like dogs or jumping around the studio like lunatics for the sake of giveaways? Where is their decency & what makes them so blind & what is it that makes them so helpless that they happily do all that to win the sponsored gifts? Amir Liaqat has left quite a mark when it comes to the way he treats the guests of his shows & I am amazed that people choose to overlook all of that & still allow him to insult them because hey, self-respect is cheaper than the freebies that they’ll be getting by the end of the day, isn’t it? Women tell him how their husbands don’t buy them anything thinking that Amir Bhai will fill that void in their lives, kids go around asking him if their father could get a bike, even girls tell him how their fiancés don’t have cars or bikes & in the end put forth their demands & expectations? What for? Since when did it become alright to stoop so low for the sake of few giveaways? & since when did begging on-screen become such a norm? I don’t hold a high opinion about the host of the show but I think what gives him the edge to mistreat & insult the guests are his guests themselves because I was shocked to see the level of desperation his audience were showing. How they were literally drooling over the gifts that they saw in the volunteers’ hands & how they literally begged him for the things they wanted. A person can never ever cross a line if he knows that the one in front of him wouldn’t allow such a treatment but when it comes to Inaam Ghar & Amir Liaqat, it looks like Amir Liaqat knows that the moment his audience will step inside the studio, they will hand over the remote control to him & will allow him to do whatever he wants to because hey, he’s got the power to give them some cheap sponsored gifts that they can’t live without. The episodes that I saw left me feeling disgusted at the shamelessness that people displayed where they found it perfectly alright to beg for Umrah tickets in exchange of Sunny Deol’s mimicry, where a woman thought that Masjid Al Aqsa was in Saudi Arabia. Seriously, why do the channel heads think it is alright to showcase this level of desperation of our people & make profits over it? Why do people like Amir Liaqat are ruling our media despite all the wrongs that they have done. Why does it become alright to ask for the donations before the call of Maghrib & then giveaway cars for free after Maghrib prayers to those who can do well for themselves but are so shameless, are so lazy & have no sense of self-sufficiency that they should move their muscles & make money for the things they are begging for in this show in front of millions of people. This level of imbalance & hypocrisy in these shows actually sheds a light on how the channels heads & hosts don’t really care about those people who show up & grace their shows, what they only care about is a game of fake make-believing & the profits that they earn by the end of this month! It is quite unfortunate that these game shows have set such a trend where people think it’s perfectly alright to turn into beggars & ask for things just like that. I hate to say this but I found no difference in these audience & those beggars who stand at the signals on the roads, at least the latter may have some difficulties in life but the former are just a bunch of people who have become shameless for the sake of freebies. Also, I must add, the unnecessary usage of music was quite disappointing too & it was sad to see people dancing in groups like robots who had no brain to differentiate between right & wrong & had no sense of shame to respect the essence of the Holy Month of Ramadan. 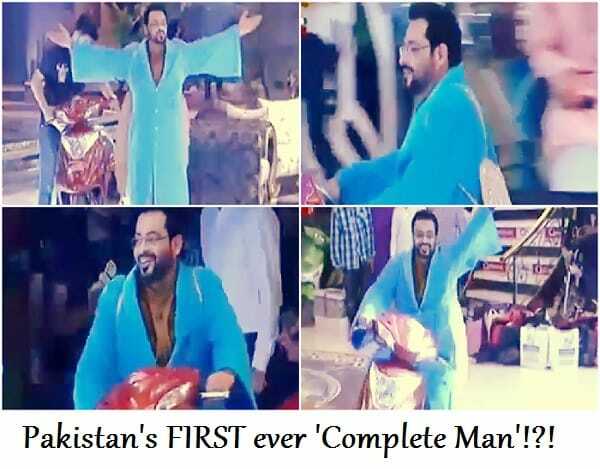 Ladies & gents sang songs on Amir Liaqat’s demand & what for? How will Amir Liaqat justify these acts where at one point before Maghrib prayers, he poses to be a religious scholar & right after Maghrib he turns into a DJ? I heard Amir Liaqat say that he is a ‘complete package’ where he molds himself into every environment, where he speaks about Islam among the scholars & then sings Bollywood songs when he is among the regular crowd. Hmmm, a complete package? LOL! I really hope that the channel heads stop earning profits over the bunch of people who have no control over their materialistic desires & they sit back & think that is the Holy month of Ramadan to be taken so lightly where they can not put hold on their game shows for 1 month & encourage people to engage in activities & deeds that will actually benefit them. I really hope that the channel heads actually encourage their content designers to design such shows that actually serve some purpose & resonate well with the spirit of the blessed & sacred month like Ramadan. I really hope that we get to see our channels showcasing something meaningful & ‘decent’ the next year because the path that they are at is quite alarming & it is sad to see that despite a huge protest against such shows, the owners of the channels are not backing out. 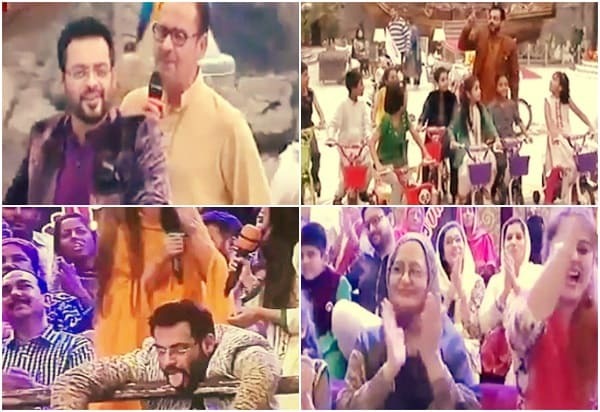 Please share your thoughts about what you guys think about the Ramadan Game Shows in general & should PEMRA take an action against these transmissions or not.